Do You Discriminate Against Older Workers? Do You Discriminate Against Older Workers - Even Subtly? With so many people unemployed worldwide, certain topics gain importance in the Human Resources world. From the perspective of the employer, the employee and the unemployed, you want to know how to avoid doing layoffs, how to hold on to the job you have, and how to overcome an employment gap when unemployment is stretching into months, and even years, for many. We've been thinking about the unemployed millions a lot lately. One population that is experiencing special job searching problems in this environment is the older crowd. Given that "older" can mean as young as 40, that's quite a percentage of the unemployed millions. They fall into two age categories, Baby Boomers, and Generation X. Generation Xers are people born between 1965 and 1976–1980, depending on the source. Gen Xers are independent, enjoy informality, are entrepreneurial, and seek emotional maturity. They want to build a repertoire of skills and experiences they can take with them if they need to, and they want their career path laid out in front of them – or they’ll walk. Gen Xers also seek balance in their lives now – not when they retire. They seek time to raise their children and don’t want to miss a minute – as their parents, the Baby Boomers, did. Gen-Xers also want immediate and honest feedback. Increasingly as Baby Boomers retire, your older workers are Gen X. We read recently that age discrimination lawsuits are up against employers over 18% - the fastest rising of any discrimination lawsuit. At a time when many jobs are disappearing forever (think administrative assistants, receptionists, landline phone installers, postal service workers, agriculture workers, data entry operators, and assorted manufacturing jobs, to start), age is playing a role in whether Mary gets the job. 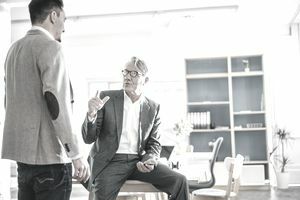 Age discrimination is illegal at any phase of the employment relationship including job postings, job descriptions, interviews, hiring, salaries, job assignments, merit increases, performance management and evaluation, training, disciplinary actions, promotions, demotions, benefits, employment termination, and layoffs. Any action that an employer takes that adversely affects a disproportionate number of employees over age 40 is also age discrimination. You must take the age of the employees who experience the impact of any employment decision such as layoffs, demotions, and employment termination into consideration. While most employers do not discriminate in their employment processes, a couple of reminders are in order. If an older employee is subject to performance coaching and disciplinary action because of performance, make sure you are applying the same requirements to all employees regardless of age. If you document the performance of any employee, make sure you document the performance of all employees who perform that job. Eliminate the possibility of age discrimination by applying all expectations and treatments equivalently. If you treat older employees differently, you do risk the potential of an age discrimination lawsuit, even if your intentions and actions were above reproach. Also, older employees are demonstrating a stronger inclination to sue in an employment environment that offers jobs that are primarily underpaid and service-type minimum wage occupations. For older workers in this environment, jobs are hard to come by. It's a lot easier to make an employer pay; you never know how a jury will see your disciplinary actions or failure to hire. Don't leave the door open for an underserved problem. Secondly, in you're hiring, remove any indicator of the age of the applicant from application materials you share with managers and staff involved in hiring. You don't want your managers subtly - and often with unawareness - discriminating about candidates selected for interviews. With unemployment so high, and the possibility of lawsuits looming, make sure your employment relationships are non-discriminatory and impeccable. Are you an employee over 40? You have the opportunity to create the best years of your career. But, you must maintain your professional relevance at any age. Here's how. Do You Know that Discriminating Against Employees Is Illegal?